Yes, you have to show them that you don’t get their sarcasm and this leads to their sarcastic efforts being unacknowledged. Pretend to misunderstand their sarcasm even if you get it all. This is a much innocent way of escaping their unnecessary remarks. And, the next thing you see is Voila! Their sarcasm won’t hit you from next time onwards. Trust me, this helps quite a lot without portraying you as a rude personality. Yeah, we don’t wanna attract haters for sure. Have you ever wanted to whisper softly in someone’s ear “JUST WALK AWAY”? Umm… that’s a bit rude now but you can just simply ignore their sarcastic comments and indulge yourself in a conversation with someone else. Or maybe, you can simply walk away. This would not only make them stop their sarcastic demeanor to go on for long but would also make them realize that you’re clearly not interested in being witty. Try this if you’re a nonchalant person and it might help you get away from it. Let’s give them all the credits they want in life and feel superior in your own way. That’s when you have to let all your generosity out of the box, put it on a platter and serve it well with a pinch of maturity. This will also show you’re a much more sensible person than they are and even more charitable, giving attention in charity. I do that always. Try it, maybe? Make them realize that they’re being way too childish if their sarcasm is getting on your nerves. You can publicly warn them about being immature, this can really make a strict impact on them. Or, you can secretly scold them in private on their ways of behaving like a juvenile. But be careful and don’t be too harsh in your speech. After all, who wants to upset others? Bring out the teacher in you and correct their sarcasm with your own wit. This is just like you’re showing them stupid enough while explaining the same point in a much simpler manner. Yes, this will make them realize that they are not so capable of ridiculing you by their sarcastic powers. This can also be a way to answer them LITERALLY!! Come back to the point of conversation as soon as possible to avoid it completely. If their sarcasm makes you really offended or sad, provided all unintentionally, just tell them to stop simply without retaliating in an insolent manner. They are your friend and so, by the virtue of this, you have all the rights to ask for a favor immediately in case their sarcastic comments are bothering you or are making you feel uncomfortable around them. But never let it inside your heart. I am sure your friend will understand. Remember, humanity still exists. LOL! If that person is being slightly selfish or mean using their sarcasm, just give yourself a break from this friendship and cut off for a while. It’s totally up to you though that whether you want to break your friendship entirely or take a small break where you both share a common feeling of returning having realized your mistakes. The most common approach to this situation is to stop talking or seeing each other for a while. Because obviously, nobody wants to lose their friend over an issue as petty as sarcasm. So, stop hanging out for a while, let it cool off for some days and make a friendly entry. Sometimes, someone’s irritation, anger, frustration, disappointment etc puts them on the verge of being sarcastic. You won’t believe it but people often stress out themselves if they are facing any one of the above-mentioned situations. It could be anything and the outcome may result in the form of a bitter sarcasm. And guess what? The worst part is you won’t even realize it. You have to notice the person’s mood and then take a step accordingly in order to maintain a healthy relationship. Beware: Sarcastic people are allergic to getting ignored. The most common way to deal with them is to laugh at their sarcasm sarcastically or non-sarcastically. You can do this. This is so easy. You just have to reply in a laugh. Self-control is a must while doing this. If the person is high on sarcasm, he should clearly get it otherwise know that a fool was practicing on you. A simple HA-HA-HA would do. Enclosed gestures might include a fake smile or a slow clap. Well, one of the best ways to deal with the sarcasm issues is to reply them with your own sarcasm. This is undoubtedly the most common way to pull it off without offending and also without getting offended. Caution: Don’t try this unless you’re sarcastic yourself or you might end up getting disheartened later. In the end, try and maintain peace in your surrounding with such people no matter if they are your friends or not. As said, old habits die hard. Give them some space and let it be because some people can’t give up this habit of being sarcastic, no matter what. 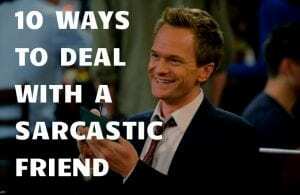 But the vantage point of being surrounded by sarcastic people is that they can teach you to be sarcastic. So, never leave them.